THE HOT PLATE: The FCI Culinary Textbook available now! The FCI Culinary Textbook available now! 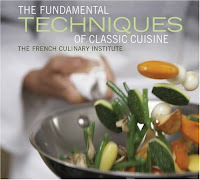 The FCI, one of the world’s leading culinary schools, presents for the first time The Fundamental Techniques of Classic Cuisine, a single sumptuous volume featuring more than 250 classic recipes and basic cooking techniques as taught by some of The FCI’s most renowned deans including master chefs Jacques Pépin, Alain Sailhac, André Soltner, and Jacques Torres. The Fundamental Techniques of Classic Cuisine represents the finest work of the culinary talents who wrote the curriculum that has taught some of today’s greatest chefs to cook. From the basic principles of the professional French kitchen to preserving food, working with vegetables, poultry, shellfish, or meats, or dealing with pastry doughs, creams, braisings or marinades, The Fundamental Techniques of Classic Cuisine is a master course in cooking. Complete with insider tips and invaluable advice from The FCI, this will be an indispensable addition to the library of serious home cooks everywhere.